Nothing Says “Netherlands Cuisine” Quite like Meatballs! When you think about traveling to Europe, what are the things you hope to see and do? For us, the merry band of Muppets, we had hoped to see things you only read about, try new and exciting things we had never done before, and taste the most marvelous concoctions. We left Bruges early morning on the 4th of October. We were camping in a caravan. That complication meant packing up every morning was a wee bit complicated. This was morning two of our trip so we were starting to get the routine down. Mrs. Stadler, the senior Muppet in the group, needed to eat eggs on Tuesday. This was important to her, for the rest of the Muppet cast, we could care less what we ate for breakfast as long as there was coffee. Monday morning came, and my mom made eggs. Mom makes the most fluffiest scrambled eggs you could ever imagine. Dad made coffee laced with French dairy. I thought I had died and went to heaven. Beats toast and lemon curd any day! You would think this would be a food highlight for me but the day just kept getting better. We quickly packed up the campsite, we became very fast and would average just under an hour and a half. This may seem like an extremely long time, but that is from the moment we opened our eyes, until we were on the road. The great thing about my family of Muppets is, we don’t waste time. Sure we cause quite the ruckus trying to complete the tasks, sure there are plenty of disasters trying to complete the tasks, but that is what increases the funny and zany quality of our family vacations! The plan that day was to drive to Bacharach, Germany and camp along the Rhine, a 432km journey that would take us through the Netherlands. This was great news! 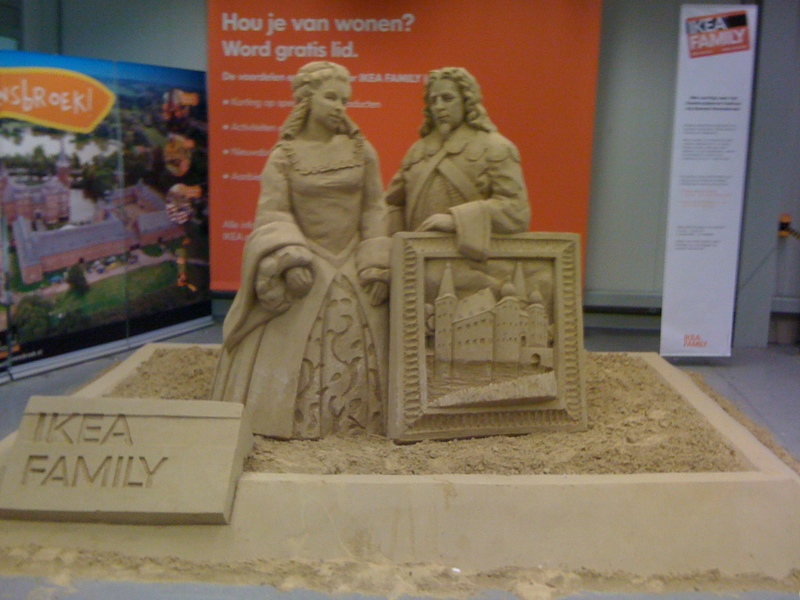 We may get a chance to try some traditional Dutch fair, like Erwtensoep, or maybe Filosoof! We crossed the border close to lunch time, so the plan was to stop and eat lunch at a cafe or bistro then move on to find a grocery store so we could make dinner in the caravan later that night. As we approached Heerlen, we were all given instructions to peer out the window and search for a possible rest stop that included a cafe of some sort. Out the window we looked, reading signs that made no sense to us. Then my Dad found it, the very place that Mrs. Stadler had been dreaming of the entire trip. Her excitement was too much for us, and the Muppet Cast shared in her enthusiastic cheer! We had found Ikea! Oh glorious Ikea! Home to the cheapest food on earth that didn’t come out of Styrofoam. Dad pulled in, parked, while the rest of us ran to the doors and left him in a cloud of dust. The best part was, there was a SPECIAL! Two plates of Swedish meatballs for the price of one. How lucky were we? 14 Euros later my family was full and happy. French groceries made breakfast in Belgium, Swedish lunch was consumed in the Netherlands and for dinner, it was German Schnitzel on the Rhine. 5 countries came together to provide a very international day of feasting. It tasted like we never left Canada. I guess we are very European indeed! Somehow R, you find the humour in everything and express it perfectly. I always knew you were multi-talented, but your writing is a real treat. I want to taste your mom’s eggs, but I don’t want to eat the meatballs. Very vivid post! I too have a blog, feel free to check it out if you would like! Put the coffee on, I’m coming over! I would have rather had peasoup or something more traditional, but it made Mrs. Stadler very happy. It was fun, the reactions of the local people when they saw the Canadiana gear we were wearing was very heartwarming! They still really appreciate the Canadian effort during the war! Lucky us were recipiants of that kindness. Something you should not try in the Netherlands is Mexican Food! In Rotterdam, there is a “Mexican” resturant which attempts to mimic mexican fare, badly. Seeing as I live near the Texas/Mexico border, and have had numerous authentic Mexican dishes (good and bad, albeit) this place in Rotterdam took the cake. I’m sure there are very few Mexicans in Rotterdam, or the Netherlands all together, someone should teach the chef what Mexican food is supposed to be like.